Curcumin has been shown to exhibit anti-inflammatory, antimutagenic, and anticarcinogenic activities. However, the effect of curcumin on the maturation and immunostimulatory function of dendritic cells (DC) largely remains unknown. In this study, we examined whether curcumin can influence surface molecule expression, cytokine production, and their underlying signaling pathways in murine bone marrow-derived DC. DC were derived from murine bone marrow cells and used as immature or LPS-stimulated mature cells. The DC were tested for surface molecule expression, cytokine production, dextran uptake, the capacity to induce T cell differentiation, and their underlying signaling pathways. 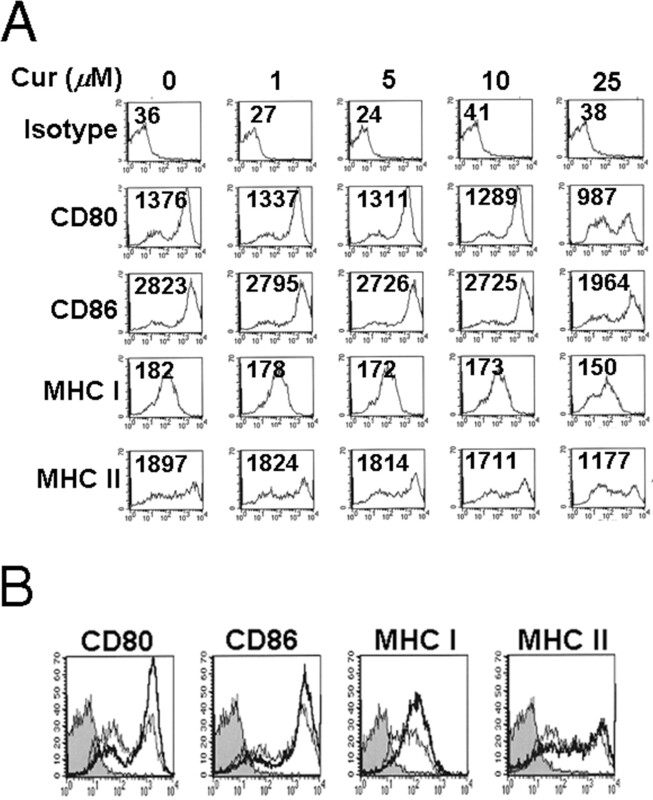 Curcumin significantly suppressed CD80, CD86, and MHC class II expression, but not MHC class I expression, in the DC. The DC also exhibited impaired IL-12 expression and proinflammatory cytokine production (IL-1β, IL-6, and TNF-α). The curcumin-treated DC were highly efficient at Ag capture, via mannose receptor-mediated endocytosis. Curcumin inhibited LPS-induced MAPK activation and the translocation of NF-κB p65. In addition, the curcumin-treated DC showed an impaired induction of Th1 responses and a normal cell-mediated immune response. These novel findings provide new insight into the immunopharmacological role of curcumin in impacting on the DC. These novel findings open perspectives for the understanding of the immunopharmacological role of curcumin and therapeutic adjuvants for DC-related acute and chronic diseases. Considerable research efforts are currently focused on the biology of dendritic cells (DC)4 in view of their possible clinical use as cellular adjuvants in the treatment of chronic infectious diseases and tumors. DC are professional APC playing key roles in the immune sentinels as initiators of T cell responses against microbial pathogens and tumors as well as inflammation (1, 2). DC residing in peripheral tissues are generally immature phenotypically and functionally (3). Immature DC do not induce primary immune responses, because they do not express the requisite costimulatory molecules, nor do they express antigenic peptides as stable complexes with MHC molecules. Immature DC effectively capture and process exogenous Ags in peripheral tissues and begin to mature. The maturing DC migrate to lymphoid organs, where they stimulate naive T cells through the signals of both MHC molecules presenting Ag-peptides and costimulatory molecules. The maturation of DC is involved with decreased or the absence of Ag uptake, high levels of MHC class II and accessory molecules expression, and the production of IL-12 upon stimulation (4, 5). Curcumin (1,7-bis(4-hydroxy-3-methoxyphenyl)-1,6-heptadiene-3,5-dione) is a phenolic natural product isolated from the rhizome of Curcuma longa (turmeric). Curcumin, the active component of turmeric, has been shown to exhibit anti-inflammatory and antimutagenic in addition to anticarcinogenic activity (6, 7). Also, previous studies also have shown that curcumin strongly inhibits the initiation and promotion of chemical carcinogen-induced tumor formation in mice (8, 9), and the proliferation of various cultured tumor cells (10, 11). These potent chemopreventive activities of curcumin may be attributed to the inhibition of certain signal transduction pathways critical to tumor cell growth, such as AP-1, NF-κB, and protein kinase C (12, 13, 14). Recently, curcumin was shown to inhibit the proliferation of HUVECs and to reduce the expression of matrix metalloproteinase-9 (15, 16). Moreover, curcumin inhibited corneal neovascularization without inhibiting 12-O-tetradecanoylphorbol-13-acetate (TPA)-induced secretion of vascular endothelial growth factor (17). Some studies suggest that the inhibitory effect of curcumin on TPA- and arachidonic acid-induced inflammation, TPA-induced production of hydrogen peroxide, cyclo-oxygenase, lipoxygenase, phospholipase A2, and phospholipase Cγ1 activities, as well as the inhibitory effect of curcumin on TPA-induced formation of c-jun mRNA, c-Jun protein, c-fos mRNA, c-Fos protein, and c-myc mRNA, appear to play important roles in tumor promotion (18, 19, 20). The cellular targets of curcumin in the immune system are poorly understood. Several groups have shown that curcumin inhibits inducible NO synthase (21, 22) and IL-12 production by monocytes/macrophages (22, 23). With respect to lymphocytes, a suppressive effect on the proliferation of splenic lymphocytes, the induction of CTL, lymphokine-activated killer cells, and the production of cytokines by T lymphocytes have been reported (24). However, the effect of curcumin on DC has not been investigated, leaving the question of its global function in the maturation and immunoregulatory activities of DC open. In this study, we analyzed the effect of a noncytotoxic concentration of curcumin on murine bone marrow (BM)-derived DC maturation and function. Our results indicate that curcumin is a potent inhibitor of myeloid DC maturation. In vivo data show that, although curcumin-treated DC migrate to T cell areas of secondary lymphoid tissue, they fail to induce normal cell-mediated contact hypersensitivity (CHS). These findings provide new insight into the immunopharmacology of curcumin. Moreover, exposure to this readily available drug provides a simple, inexpensive, and highly effective means to manipulate the immunostimulatory capacity of DC. Due to the critical role of these professional APC in the initiation and regulation of immune responses and the ready availability of curcumin, our findings may have important implications for the manipulation of DC functions for potential therapeutic application. Male 8- to 10-wk-old C57BL/6 (H2Kb and IAb) and BALB/c (H2Kd and IAd) mice were purchased from the Korean Institute of Chemistry Technology (Daejeon, Korea). They were housed in the specific pathogen-free central animal facility of Pusan National University for at least 1 wk before use. Recombinant mouse (rm)GM-CSF and rmIL-4 were purchased from R&D Systems. Curcumin, Limulus amebocyte assay (E-TOXATE), dextran-FITC (molecular mass, 40,000), and LPS (from Escherichia coli 055:B5) were obtained from Sigma-Aldrich. An endotoxin filter (END-X) and an endotoxin removal resin (END-X B15) were acquired from Associates of Cape Cod. Cytokine ELISA kits for murine IL-1β, IL-6, IL-10, IL-12 p70, and TNF-α were purchased from BD Pharmingen. FITC- or PE-conjugated mAbs used to detect the expression of CD11c (HL3), CD80 (16-10A1), CD86 (GL1), IAb β-chain (AF-120.1), H2Kb (AF6-88.5), or the intracellular expression of IL-12 p40/p70 (C15.6) or IL-10 (JESS-16E3) by flow cytometry, as well as isotype-matched control mAbs, biotinylated anti-CD11c (N418) mAb, were purchased from BD Pharmingen. To detect protein levels, anti-phospho-ERK, anti-ERK, anti-phospho-p38, anti-p38, anti-phospho-JNK, and anti-JNK from Cell Signaling, and anti-p65 Ab from Abcam were purchased. DC were generated from murine BM cells, as described by Inaba et al. (25, 26) with modifications. Briefly, BM was flushed from the tibiae and femurs of C57BL/6 and depleted of red cells with ammonium chloride. The cells were plated in six-well culture plates (106 cells/ml; 3 ml/well) in OptiMEM (Invitrogen Life Technologies) supplemented with 10% heat-inactivated FBS, 2 mM l-glutamine, 100 U/ml penicillin, 100 μg/ml streptomycin, 5 × 10−5 M 2-ME, 10 mM HEPES (pH 7.4), 20 ng/ml rmGM-CSF and rmIL-4 at 37°C, 5% CO2. On day 3 of the culture, floating cells were gently removed, and fresh medium was added. On day 6 or 7 of the culture, nonadherent cells and loosely adherent proliferating DC aggregates were harvested for analysis or stimulation, or, in some experiments, replated in 60-mm dishes (106 cells/ml; 5 ml/dish). On day 7, 80% or more of the nonadherent cells expressed CD11c. In certain experiments, to obtain highly purified populations for subsequent analyses, the DC were labeled with bead-conjugated anti-CD11c mAb (Miltenyi Biotec) followed by positive selection through paramagnetic columns (LS columns; Miltenyi Biotec) according to the manufacturer’s instructions. The purity of the selected cell fraction was >90%. Curcumin was dissolved in DMSO, or DMSO alone (0.01% v/v) was added to cultures of isolated DC in six-well plates (106 cells/ml; 3 ml/well). DMSO (0.1%) alone was used as control because of no cytotoxicity in DC. For the analysis of apoptosis, DC were stimulated with LPS or left without any stimuli, and apoptosis was analyzed over time by staining of phosphatidylserine translocation with FITC-annexin V in combination with propidium iodine kit (BD Pharmingen) according to the manufacturer’s instructions. A flow cytometric analysis was performed, as described by Kodaira et al. (27). Briefly, 5 × 105 cells were incubated in staining buffer (PBS with 2% FBS and 0.1% sodium azide) containing anti-CD16/CD32 Ab (BD Pharmingen) for 15 min on ice to block the nonspecific binding of Igs. Cells stained with the appropriate isotype-matched Ig were used as negative controls. After staining, the cells were fixed with 2% w/v paraformaldehyde and analyzed by FACSCalibur, using CellQuest software (BD Biosciences). For intracellular cytokine staining, the cells were treated with brefeldin A (10 μg/ml; 4 h; 37°C), washed with 1% v/v FBS-PBS (staining buffer), stained with FITC-conjugated anti-CD11c mAb, and fixed in 4% w/v paraformaldehyde (20 min for 4°C). Subsequently, the cells were washed twice in staining buffer, permeabilized in 100 μl of 0.1% saponin, 1% FBS-PBS (permeabilization buffer), and incubated with PE-conjugated ani-IL-12 p40/p70 or anti-IL-10 mAb (30 min; 4°C). Appropriate isotype-matched, irrelevant mAbs served as negative controls. Culture supernatants were analyzed by ELISA. The OD450 of triplicate samples was determined and corrected by a microplate reader, with readings at 570 nm. The minimum detection levels were as follows: IL-1β, 10 ng/ml; IL-4, 7.8 pg/ml; IL-6, 15.6 ng/ml; IL-10, 31.3 pg/ml; IL-12 p70, 12.3 pg/ml; IFN-γ, 31.3 pg/ml; and TNF-α, 15.6 pg/ml. Endocytosis was quantitated, as described by Lutz et al. (28) and Sallusto et al. (29). In brief, 2 × 105 cells were equilibrated at 37 or 4°C for 10 min and then pulsed with fluorescein-conjugated dextran (40,000 molecular mass; Sigma-Aldrich) at a concentration of 1 mg/ml. Cold staining buffer was added to stop the reaction. The cells were washed three times and stained with PE-conjugated anti-CD11c Abs, and then analyzed by FACSCalibur. Nonspecific binding of dextran to DC, determined by incubation of DC with FITC-conjugated dextran at 4°C, was subtracted. The medium used in the culture, to stimulate DC with curcumin, was supplemented with GM-CSF, because the ability of DC to capture Ag is lost if DC are cultured without GM-CSF (29). The cells were treated with curcumin for 45 min followed by LPS (200 ng/ml). In brief, the cells were washed with PBS (pH 7.4) and resuspended in hypotonic buffer (10 mM HEPES (pH 7.9), 1.5 mM MgCl2, 10 mM KCl, 0.2 mM PMSF, and 0.5 mM DTT), and allowed to swell on ice for 10 min. The cells were homogenized, and the nuclei were separated by centrifugation at 3,300 × g for 5 min at 4°C. The supernatant was used as a cytoplasmic extract. The nuclear pellet was extracted in nuclear extraction buffer (20 mM HEPES (pH 7.9), 0.4 M NaCl, 1.5 mM MgCl2, 0.2 mM EDTA, 25% glycerol, 0.5 mM PMSF, and 0.5 mM DTT) for 30 min on ice and centrifuged at 12,000 × g for 30 min. The supernatant was used as a nuclear extract. The protein concentrations in the supernatants of both the nuclear and cytoplasmic extracts (20 μg) were resolved by SDS-PAGE and then electrotransferred to the nitrocellulose membrane. The membranes were incubated with anti-phospho-ERK, anti-ERK, anti-phospho-p38, anti-p38, anti-phospho-JNK, anti-JNK, or anti-p65 Ab, washed, incubated further with HRP-conjugated anti-rabbit IgG (1/1000 dilution), and detected using an ECL detection system (Amersham Biosciences). A total of 2 × 106 DC was transfected with 2 μg of NF-κB-Luciferase reporter plasmids using Lipofectamine according to the manufacturer’s protocol (Invitrogen Life Technologies). After incubating with DNA-Lipofectamine mixtures, the cells were preincubated in the presence or in the absence of curcumin (25 μM) before being stimulated with LPS for 6 h. After stimulation, the cells were washed, lysed, and assayed for luciferase activity, according to the manufacturer’s instructions (Luciferase Assay System kit; Promega) with a Microplate luminometer LB96V (PerkinElmer). Splenocytes, isolated from female BALB/c mice at 5–8 wk of age, were passed over nylon wool columns to enrich T cells. Nylon wool nonadherent splenocytes (2 × 105 cells/well) were cocultured with mitomycin (50 μg/ml)-treated DC isolated from C57BL/6 mice as described above. Mixed cultures were conducted in RPMI 1640 supplemented with 1% mouse serum (from BALB/c mice), 2 mM l-glutamine, 100 U/ml penicillin, 100 μg/ml streptomycin, 5 × 10−5 M 2-ME, and 10 mM HEPES (pH 7.4) in 96-well round-bottom plates at 37°C, 5% CO2 in air. Cell proliferation was estimated based on uptake of [3H]thymidine (ICN). For this purpose, the cells were pulsed with 1 μCi/ml [3H]thymidine for 18 h, with the radioactivity of harvested cells, and then measured using a liquid scintillation counter (Wallac Oy). In the sensitization phase, bead-sorted CD11c+ DC were pulsed with 0.1% w/v TNBS (Sigma-Aldrich) in PBS for 15 min at 37°C. After three washing in PBS, the cells were counted, and their viability was assessed by trypan blue exclusion. One million cells were injected s.c. into the abdomen of animals shaved and painted with 7% w/v 2,4,6-trinitrochlorobenzene (TNCB; Sigma-Aldrich) diluted in acetone-olive oil, 4/1 v/v (vehicle). Negative controls included animals injected with unpulsed DC (without hapten) and animals treated with the vehicle alone. Seven days after sensitization, the mice were painted on the dorsal and ventral side of the left ear with 10 μl of 1% TNCB in vehicle. The thickness of the left (challenged) and the right (control) ear was measured after 24 h by using an engineer’s spring-loaded micrometer (Mitutoyo). The percentage increase in ear thickness was calculated using the following formula: 100 × ((thickness of challenged ear − thickness of unchallenged ear)/thickness of unchallenged ear). The Student t test was used for statistical analysis. A value of p < 0.01 or 0.05 was considered to indicate statistical significance. Normal distribution of values, a prerequisite for using the Student t test, was proved by using the Kolmogorov-Smirnov test. Results are expressed as means ± SD. All statistical analyses were performed using the SPSS software, version 8.0. In the first series of experiments, we examined whether curcumin influences the maturation of DC. BM cells were cultured for 7 days in an OptiMEM supplemented with 20 ng/ml GM-CSF and 20 ng/ml IL-4 in the presence or absence of different concentrations of curcumin for 24 h. Because concentrations of curcumin >50 μM were found to be somewhat cytotoxic to BM cells, curcumin was used at concentrations ≤25 μM. There were no marked differences in the percentage of dead cells according to the CD11c+ cells and annexin-V/propidium iodide (PI) staining (Fig. 1⇓). Curcumin has no influence on growth and no cytotoxicity in CD11c+ DC. BM-derived DC were generated as described in Materials and Methods (with or without the indicated concentration of curcumin in the absence (−) or presence (+LPS) of LPS) and analyzed at day 7 by flow cytometry. DC were stained for CD11c (A), and annexin-V and PI (B). The percentage within each histogram represents the incidence of CD11c+ cell (A) and annexin-V+PI+ (B). The differences were compared using the t test for paired samples (C and D). Data are means (±SD). The results are representative of five separate experiments. To investigate the effect of different concentrations of curcumin on DC maturation, BM-derived cells were cultured from 24 h in the presence of 1–25 μM curcumin, as described in Materials and Methods. The expression of costimulatory molecules (CD80 and CD86) and MHC class II molecules in DC after the stimulation in a dose-dependent fashion with curcumin was examined (Fig. 2⇓). As shown in Fig. 2⇓, 25 μM curcumin was sufficient to reduce the expression of CD80, CD86, and MHC class II molecules on CD11c+ cells on day 7. The inhibitory effect of curcumin was dose dependent and targeted primarily the expression of CD86 and MHC class II molecules. Stimulation of cells with LPS from day 6 resulted in the up-regulation of CD80, CD86, and MHC class II expression within 24 h. Curcumin-treated DC consistently expressed lower levels of these surface markers compared with untreated cells (Fig. 3⇓ and Table I⇓). This observation indicates that curcumin-treated DC were at least partially resistant to phenotypic maturation. Curcumin inhibits the expression of CD80, CD86, and MHC class II on BM-derived DC in a dose-dependent manner. BM-derived DC were generated as described in Materials and Methods. On day 6, different concentrations of curcumin (0–25 μM) were treated in GM-CSF- and IL-4-induced DC. On day 7, the cells were harvested and analyzed by two-color flow cytometry. The cells were gated on CD11c+. The results are from one representative experiment of three performed. Curcumin decreases the expression of CD80, CD86, and MHC class II on LPS-induced mature DC. A, BM-derived DC were generated as described in Materials and Methods. On day 6, different concentrations of curcumin (0–25 μM) were treated for 45 min following LPS stimulation (200 ng/ml). On day 7, cells were harvested and analyzed by two-color flow cytometry. The cells were gated on CD11c+. B, The histogram was overlapped (gray line, isotype control; thin line, curcumin plus LPS; and thick line, curcumin). The results are from one representative experiment of three performed. A major attribute of mature DC is the synthesis and release of cytokines with important modulatory functions in inflammation and T cell differentiation. DC produce proinflammatory cytokines (such as IL-1β, IL-6, IL-12, and TNF-α). Especially, IL-12 production is also an important marker for DC maturation and can be used as a method of selecting Th1-dominant adjuvant. Secretion of bioactive IL-12 p70 requires the coordinated expression of two subunits, p35 and p40, which are encoded by two separate genes and regulated independently (30). We therefore tested whether curcumin may regulate cytokine production in LPS-induced maturation of DC. As shown in Fig. 4⇓A, intracellular staining of FITC-labeled anti-CD11c+ DC with PE-labeled anti-IL-12 p40/p70 or anti-IL-10 mAbs revealed that curcumin-stimulated DC (25 μM) expressed low amounts of IL-12 p40/p70 (28.6 ± 4.5%) compared with unstimulated DC (4.3 ± 2.1%), whereas IL-10 was not detectable. When supernatants were analyzed by ELISA (detection limit, 30 pg/ml), IL-10 was also undetectable after 200 ng/ml LPS stimulation for 24 h. As shown in Fig. 4⇓B, analysis of IL-12 p70 production by ELISA showed high levels when the DC were stimulated with LPS (246 ± 28 ng/ml) for 24 h. Curcumin (154 ± 24 ng/ml) alleviated the effect of LPS. The changes in cytokine production were not due to a toxic effect of curcumin, because the trypan blue exclusion test did not show increased cell death after 25 μM curcumin stimulation for 24 h (data not shown). In addition, curcumin inhibited proinflammatory cytokine release (IL-1, IL-6, and TNF-α) by DC stimulated with LPS (Table II⇓). The above results indicated that exposure to curcumin impaired the capability of DC to produce high amounts of IL-12 p70 and proinflammatory cytokines. Thus, these phenomena suggest that curcumin suppresses the function maturation of DC stimulated with LPS. Curcumin impaired the intracellular IL-12 p40/p70 and the secretion of bioactive IL-12 p70 in LPS-stimulated DC. A, Analysis of IL-12 p40/p70 and IL-10 expression in CD11c+ DC by intracellular cytokine staining after LPS stimulation (24 h). 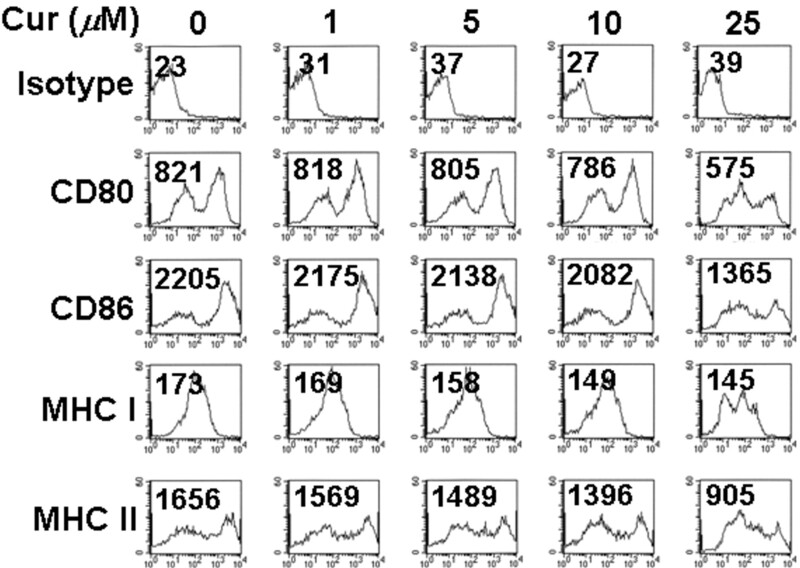 The numbers indicate percentages of CD11c+ cells expressing IL-12 p40/p70 or IL-10. The results are representative of three separate experiments. B, Analysis of IL-12 p70 production by magnetic bead-purified DC (1 × 106 cells) over time (6–48 h) after LPS stimulation (200 ng/ml) using ELISA. The data represent the means (±SD) of three separate experiments. The expression of surface molecules and IL-12 p70 secretion indicated that exposure to curcumin significantly suppressed the phenotypic and functional maturation of in vitro-generated DC. However, these results did not exclude the possibility that curcumin caused a general inhibition of DC physiological function. We therefore next asked whether stimulation of DC with curcumin changes the ability of DC to capture Ag based on uptake of FITC-conjugated dextran. As shown in Fig. 5⇓, DC from the day 6 culture, treated for 24 h with curcumin in the presence of LPS, showed uneqivocally higher endocytic capacity for FITC-dextran than did LPS-treated DC. These data suggest that curcumin induced the immature state of DC. Curcumin-treated DC exhibit increased enhanced endocytic capacity. BM-derived DC were generated as described in Materials and Methods (±25 μM curcumin) and harvested on day 7. FITC-dextran was analyzed on CD11c-PE-positive cells by flow cytometry. The numbers indicate the percentage of CD11c+ cells (A) and the mean fluorescence intensity (B) that were positive for FITC-dextran. The results are representative of two separate experiments that gave similar results. There is recent evidence that curcumin can inhibit MAPKs and NF-κB (13). MAPKs and NF-κB activation are an important event underlying DC maturation (31). Also, LPS stimulation has been shown to activate MAPKs and NF-κB signal pathways in DC (32, 33). To gain insight into curcumin-induced signaling, we determined whether MAPKs and NF-κB might be involved in curcumin-induced signaling pathways in DC. Immature DC were treated with curcumin before LPS stimulation. LPS induced the phosphorylation of ERK, p38, and JNK as shown in Fig. 6⇓A. However, a pretreatment with curcumin completely inhibited LPS-induced up-regulation of phosphorylation in MAPKs. Furthermore, LPS signal transduction has been shown by other researchers to activate a variety of signal pathways, including the NF-κB pathway (34), which plays a critical role in gene expression regulation. To determine whether curcumin decreases LPS-induced activation of NF-κB, nuclear translocation of the NF-κB p65 subunit and an NF-κB promoter assay were performed. LPS induced the nuclear translocation of the NF-κB p65 subunit into the nucleus (Fig. 6⇓B). However, pretreatment with curcumin suppressed the NF-κB p65 nuclear translocation that was induced by LPS stimulation. In addition, the curcumin treatment strongly repressed LPS-induced NF-κB promoter activity (Fig. 6⇓C). These results indicate that curcumin inhibits LPS-induced NF-κB activation by suppressing MAPK signal pathway. Curcumin decreased the activation of MAPKs and tranlslocation NF-κB p65 in LPS-stimulated DC. A, DC were pretreated with 25 μM curcumin for 45 min before LPS stimulation (200 ng/ml). The cell lysates were prepared and measured by Western blot analysis. B, DC were pretreated with 25 μM curcumin for 45 min followed by stimulation with LPS for 15 or 30 min. Nuclear extract were prepared and the nuclear translocated NF-κB p65 was measured by Western blot using an anti-p65 Ab. A quantitative analysis of the Western blot signal using image analysis and GenDoc software is shown. C, The DC (2 × 106 cells) were transfected with NF-κB reporter. Twenty-four hours after transfection, the DC were preincubated in the presence or absence of curcumin (25 μM) for 45 min and then stimulated with 200 ng/ml LPS for 6 h. Shown are the relative light units (RLU), indicated as the average RLU and SE of three independent experiments (∗, p < 0.05 vs LPS-stimulated DC; ∗∗, p < 0.01 vs unstimulated DC). To test whether curcumin inhibits maturation of DC to fully functional APC, DC from day 6 cultures that had been incubated with curcumin for 24 h were tested for their capacity to stimulate allogeneic T cells. Another key determinant of DC potency is their ability to adhere to T cells to form clusters. 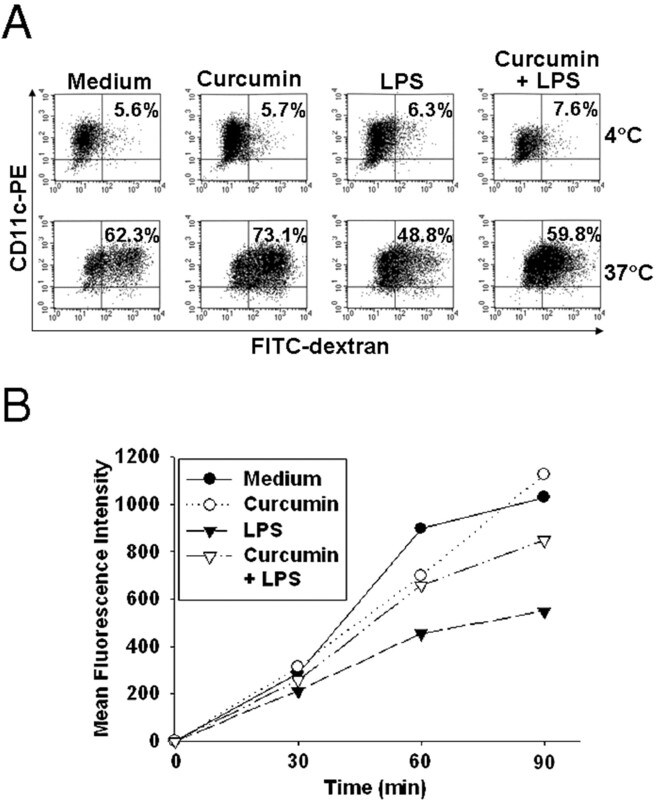 Curcumin decreased the size of DC/T cell clusters, compared with those of LPS (Fig. 7⇓A). The size of the clusters formed between curcumin-treated DC in the presence of LPS was 50% smaller than that with only LPS-stimulated DC. As shown in Fig. 7⇓B, LPS-stimulated DC enhanced proliferative responses more effectively than untreated DC, whereas curcumin impaired these effects of allogeneic T cells by LPS-induced mature DC. Additionally, given the inhibitory effect of curcumin on IL-12, Th1-inducing cytokine, by DC, we next examined the quality of the primary T cell response induced by DC matured in the presence of curcumin. Naive allogeneic T cells primed with mature DC differentiated into Th1 lymphocytes because they produced large amounts of IFN-γ and low levels of IL-4 (Fig. 7⇓, C and D). In contrast, T lymphocytes primed with DC matured in the presence of curcumin displayed a reduced production of IFN-γ. These results suggested that most of the effects of curcumin on the T cell-differentiating properties of DC were consequent to the inhibition of IL-12 production. DC in the presence of curcumin display impaired ability to induce the proliferation of allogeneic T cells and initiate Th1 responses in vitro. The DC were incubated for 24 with medium alone, curcumin (25 μM), LPS (200 ng/ml), or curcumin plus LPS. The DC were washed, and then cocultured with T cells. A, Clustering was assessed after 64 h. One representative experiment of five, showing a representative field in a culture well (96-well plate) photographed using an inverted phase contrast microscope. B, A MLR was conducted for 5 days. A background level of [3H]TdR uptake was determined by measuring reactions without stimulator. C, The cells were then examined for cytokine release by ELISA after 24 h. The data are expressed as nanograms/milliliter/106 cells ± SD of triplicate cultures (∗∗, p < 0.05 vs T cells primed with immature DC). Data are a representative experiment of five performed. A single s.c. injection of 106 TNBS-pulsed, purified DC induced a strong CHS response visualized after challenge of the animals with the model hapten 7 days later. By contrast, curcumin-treated DC failed to elicit a significant immune response (Fig. 8⇓). In fact, the responses of animals sensitized with TNBS-pulsed, curcumin-treated DC were similar to those of unsensitized animals. Control groups injected with unpulsed DC (without hapten; negative control) and animals sensitized by epicutaneous application of the model hapten (positive control) proved that the immune response was Ag specific. Curcumin-treated DC fail to induce a normal cell-mediated immune response. One million purified DC cultured in the presence or absence of curcumin (25 μM) were pulsed with 0.1% w/v TNBS and injected s.c. on day 0, as described in Materials and Methods. In control groups, DC were either not TNBS-pulsed ((−) control) and injected s.c., or animals were shaved and the skin of their abdomen painted with 7% w/v TNCB ((+) control). After 7 days, the left ears were challenged epicutaneously with 1% w/v TNCB, and the ear thickness was measured after 24 h. The results represent the mean (±SD) percentage increase of ear swelling for five animals in the treatment groups and three animals in the control groups. Treatment with vehicle alone did not induce a swelling response. The values of p were calculated by Student’s t test for independent samples (∗∗, p < 0.01 vs curcumin-DC or (−) control). This is the first report of which we are aware concerning the effects of curcumin on the phenotypic and functional maturation of murine BM-derived DC. It is also the first study in which DC exposed to curcumin have been tested for the capacity to sensitize recipients for cell-mediated immune responses. In previous studies, many researches have reported that curcumin exerted a variety of biological effects including antioxidant (6, 7), antiproliferative (10, 11), and cancer chemopreventive activities (8, 9). Also, it reduced levels of inducible NO synthase and IL-12 through the inhibition of the NF-κB signal pathway in monocytes/macrophages (21, 22, 23). Nevertheless, the effect of curcumin on the maturation and immunological responses of DC largely remains unknown. DC are also considered to play an important role in the establishment of hypersensitivity and transplantation tolerance (35, 36). Therefore, we performed functional assays to ascertain the phenotype and function of curcumin-treated DC and in addition conducted in vivo assessment of their capacity to hypersensitivity. The results indicate that the effect of curcumin involved primarily the suppression of MAPKs and NF-κB p65 activation. To ensure that the observed effects of curcumin could be ascribed to DC and not to contaminating cells present in BM-derived cell cultures, the DC were purified (>90%) before analysis in each of the assays undertaken. Our results indicated that curcumin is conclusively a potent inhibitor of LPS-induced DC maturation. These findings provide new insight into the immunopharmacology of curcumin. Moreover, exposure to this readily available drug provides a simple, inexpensive, and highly effective means to manipulate the immunostimulatory capacity of DC. Curcumin inhibited the maturation of DC in a dose-dependent manner. The extent of maturation inhibition by curcumin was similar to IL-10 (37, 38), TGF-β (39, 40), corticosteroids (41, 42), cyclosporine (43), 1,25-dihydroxyvitamin D3 (44, 45, 46), and aspirin (47). It can be argued that the strong suppressive effects of curcumin on DC maturation are attributable to a nonspecific inhibitory effect. Therefore, we also investigated the capacity of curcumin-treated DC to internalize FITC-dextran via mannose receptor-mediated endocytosis. This mechanism is characteristic and distinctive of immature vs mature DC (48). 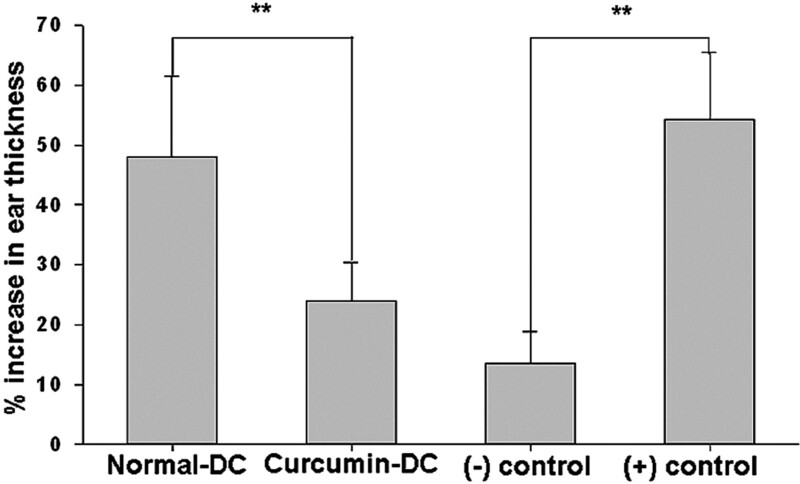 The endocytic capacity of curcumin-treated DC was strongly increased, indicating that curcumin inhibited the phenotypical and functional maturation of DC. Similar findings have been reported with other inhibitors of DC maturation, like 1,25-dihydroxyvitamin D3 (44, 45, 46), glucocorticoids (41, 42), and IL-10 (37, 38). These data further support the view that exposure to curcumin promoted the functionally immature DC. Recent accumulating evidence suggests that cytokine production of DC depends either on DC subsets or on stimuli that DC receive (49). Especially, IL-12 has multiple immunoregulatory functions, inducing the activation of the Th1 subset, which plays a pivotal role in the induction of inflammation, such as arthritis (50, 51, 52). It has also been reported that curcumin inhibits bioactive IL-12 production and IL-12 p40 secretion by macrophages (22, 23). However, the effect of curcumin has not previously been shown in DC. In the present study, we showed that curcumin induced CD11+ DC to produce IL-12 and IL-10 in the presence of LPS. Our results confirm the inhibitory effect of curcumin on intracellular IL-12 p40/p70 and IL-12 p70 expression, whereas the production of IL-10 was not altered in DC stimulated with LPS in the presence of GM-CSF and IL-4. The exposure to curcumin also impaired the production of proinflammatory cytokines (IL-1, IL-6, and TNF-α). These data indicate a potent inhibitor of proinflammatory cytokine production by curcumin that may differ according to the nature of the target cells. A line of evidence indicates that the development toward Th1 cells is regulated mainly by DC-derived cytokines, such as IL-12 (53) and IFN-γ (54). Additionally, this study showed that LPS-stimulated CD11c+ DC skewed naive T cells toward IFN-γ-producing T cells. It was demonstrated that curcumin significantly impaired the capacity to proliferate and initiate Th1 responses in vitro. Naive T cells stimulated with DC exposed to curcumin produced lower levels of IFN-γ, but not significantly altered IL-4. These results indicated that curcumin is a potent inhibitor of DC maturation. Because Th1 cells are functionally immunogenic or protective against invading pathogens, the inhibition of DC-mediated Th1 polarization may constitute an immunosuppressive mechanism of curcumin. However, the inhibition of Th1 development exerts negative regulatory roles for a wide variety of immune cells (30). Hence, the inhibition by curcumin of IL-12 production from LPS-stimulated CD11c+ DC might also contribute to the induction of the immunosuppressive state. On the basis of our in vitro observation, we hypothesized that curcumin-treated DC would exhibit impaired ability to stimulate naive T cells in vivo and to initiate a cell-mediated immune response. It was demonstrated recently that as few as 105 TNBS-pulsed murine BM-derived DC (TNBS-DC) could induce a strong CHS (47, 55). The ability of DC to induce T cell-mediated immune responses was examined using TNBS-DC to sensitize for CHS in naive syngeneic recipients. Following s.c. injection of 105 TNBS-DC, but not TNBS-DC pretreated curcumin, sensitized for CHS. These results indicate that the decreased T cell-stimulatory capacity of curcumin-treated, BM-derived DC is not readily reversed after removal of curcumin is sustained in vivo. It has been well accepted that NF-κB signaling pathway plays important roles in the maturation of DC (13). There are several important molecules such as NF-κB, IκB, IκB kinase, within NF-κB signaling pathway. However, NF-κB is the key protein in the pathway, and has been described as a major culprit and a therapeutic target in mature DC-related diseases. The data from experimental studies have demonstrated that curcumin inhibits activation of NF-κB in different cell types, suggesting the inhibitory effects of curcumin on cancer cells (56). In addition to NF-κB, MAPK has received increasing attention as a target molecule for mature DC-related therapy. It has been reported that activation of the MAPK pathways may cause the induction of phase II detoxifying enzymes, and inhibition of MAPK pathways may inhibit AP-1- and/or NF-κB-mediated gene expression (57). MAPK pathway consists of a three-tiered kinase core where a MAP3K activates a MAP2K that activates a MAPK (ERK, JNK, and p38), resulting in the activation of NF-κB, cell growth, and cell survival (58, 59). In this study, we firstly demonstrated that the effects of curcumin inhibit the maturation of murine BM-derived myeloid DC. At nontoxic concentration, curcumin proved to be a potent inhibitor of DC maturation. This inhibitory effect of curcumin on DC maturation is associated with suppressed activation of MAPKs and NF-κB as potential targets. In conclusion, we revealed a variety of effects of curcumin on BM-derived DC. Curcumin inhibited the phenotypic maturation and modulated the cytokine production of these DC, resulting in the inhibition of Th1 development. These findings underpin the immunopharmacological roles of curcumin. Moreover, exposure to this readily available drug provides a nontoxic and highly effective means to manipulate the immunostimulatory capacity of DC. ↵1 This study was supported by Korea Research Foundation CKRF-2004-002-E00071 and partially by Ministry of Science and Engineering CM10500000008-0550000008107; and by Pusan National University in the program, Postdoctoral Fellowship 2004. ↵2 G.-Y.K. and K.-H.K. contributed equally to this work. ↵4 Abbreviations used in this paper: DC, dendritic cell; TPA, 12-O-tetradecanoylphorbol-13-acetate; BM, bone marrow; CHS, contact hypersensitivity; TNBS, 2,4,6-trinitrobenzenesulfonic acid; TNCB, 2,4,6-trinitrochlorobenzene; PI, propidium iodide. Crowley, M., K. Inaba, R. M. Steinman. 1990. Dendritic cells are the principal cells in mouse spleen bearing immunogenic fragments of foreign proteins. J. Exp. Med. 172: 383-386. Steinman, R. M.. 1991. The dendritic cell system and its role in immunogenicity. Annu. Rev. Immunol. 9: 271-296. Cella, M., F. Sallusto, A. Lanzavecchia. 1997. Origin, maturation and antigen-presenting function of dendritic cells. Curr. Opin. Immunol. 9: 10-16. Stoner, G. D., H. Mukhtar. 1995. Polyphenols as cancer chemopreventive agents. J. Cell. Biochem. Suppl. 22: 169-180. Kuttan, R., P. Bhanumathy, K. Nirmala, M. C. George. 1985. Potential anticancer activity of turmeric (Curcuma longa). Cancer Lett. 29: 197-202. Huang, M. T., Y. R. Lou, W. Ma, H. L. Newmark, K. R. Reuhl, A. H. Conney. 1994. Inhibitory effects of dietary curcumin on forestomach, duodenal, and colon carcinogenesis in mice. Cancer Res. 54: 5841-5847. Conney, A. H., T. Lysz, T. Ferraro, T. F. Abidi, P. S. Manchand, J. D. Laskin, M. T. Huang. 1991. Inhibitory effect of curcumin and some related dietary components on tumor promotion and arachidonic acid metabolism in mouse skin. Adv. Enzyme Regul. 31: 385-396. Khar, A., A. M. Ali, B. V. Pardhasaradhi, Z. Begum, R. Anjum. 1999. Antitumor activity of curcumin is mediated through the induction of apoptosis in AK-5 tumor cells. FEBS Lett. 445: 165-168. Mehta, K., P. Pantazis, T. McQueen, B. B. Aggarwal. 1997. Antiproliferative effect of curcumin (diferuloylmethane) against human breast tumor cell lines. Anticancer Drugs 8: 470-481. Huang, T. S., S. C. Lee, J. K. Lin. 1991. Suppression of c-jun/AP-1 activation by an inhibitor of tumor promotion in mouse fibroblast cells. Proc. Natl. Acad. Sci. USA 88: 5292-5296. Singh, S., B. B. Aggarwal. 1995. Activation of transcription factor NF-κB is suppressed by curcumin. J. Biol. Chem. 270: 24995-25000. Liu, J. Y., S. J. Lin, J. K. Lin. 1993. Inhibitory effects of curcumin on protein kinase C activity induced by 12-O-tetra-decanoylphorbol-13-actate in NIH3T3 cells. Carcinogenesis 14: 857-861. Thaloor, D., A. K. Singh, G. S. Sidhu, P. V. Prasad, H. K. Kleinman, R. K. Maheshwari. 1998. Inhibition of angiogenic differentiation of human umbilical vein endothelial cells by curcumin. Cell Growth Differ. 9: 305-312. Mohan, R., J. Sivak, P. Ashton, L. A. Russo, B. Q. Pham, N. Kasahara, M. B. Raizman, M. E. Fini. 2000. Curcuminoids inhibit the angiogenic response stimulated by fibroblast growth factor-2, including expression of matrix metalloproteinases gelatinase B. J. Biol. Chem. 275: 10405-10412. Arbiser, J. L., N. Klauber, R. Rohan, R. van Leeuwen, M. T. Huang, C. Fisher, E. Flynn, H. R. Byers. 1998. Curcumin is an in vivo inhibitor of angiogenesis. Mol. Med. 4: 376-383. Huang, M. T., R. C. Smart, C. Q. Wong, H. H. Connery. 1988. Inhibitory effect of curcumin, chlorogenic acid, caffeic acid, and ferulic acid on tumor promotion in mouse skin by 12-O-tetradecanoylphorbol-13-acetate. Cancer Res. 48: 5941-5946. Huang, M. T., W. Ma, P. Yen, J. G. Xie, J. Han, K. Frenkel, D. Grunberger, A. H. Conney. 1997. Inhibitory effects of topical application of low doses of curcumin on 12-O-tetradecanoylphorbol-12-acetate-induced tumor promotion and oxidized DNA bases in mouse epidermis. Carcinogenesis 18: 83-88. Mukundan, M. A., M. C. Chacko, V. V. Annapurna, K. Krishnaswamy. 1993. Effect of turmeric and curcumin in BP-DNA adducts. Carcinogenesis 14: 493-496. Brouet, I., H. Ohshima. 1995. Curcumin, an anti-tumour promoter and anti-inflammatory agent, inhibits induction of nitric oxide synthase in activated macrophages. Biochem. Biophys. Res. Commun. 206: 533-540. Chan, M. M., H. I. Huang, M. R. Fenton, D. Fong. 1998. In vivo inhibition of nitric oxide synthase gene expression by curcumin, a cancer preventive natural product with anti-inflammatory properties. Biochem. Pharmacol. 55: 1955-1962. Kang, B. Y., S. W. Chung, W. Chung, S. Im, S. Y. Hwang, T. S. Kim. 1999. 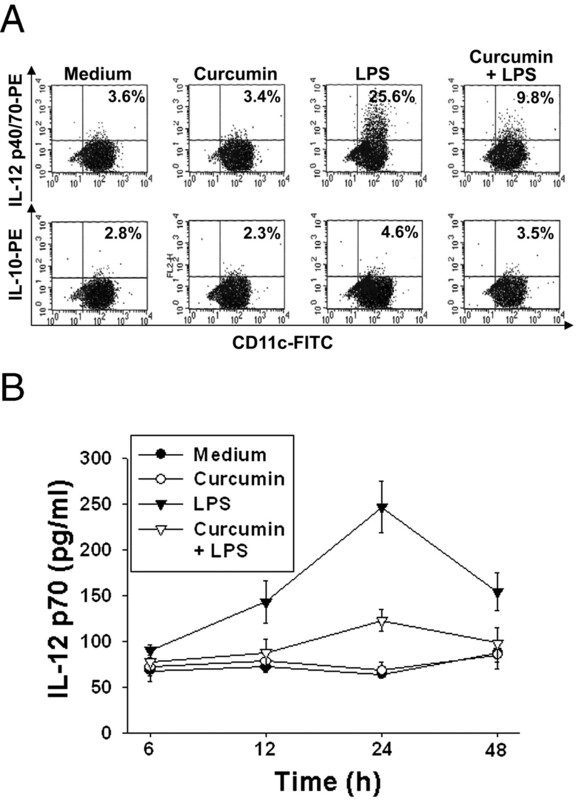 Inhibition of interleukin-12 production in lipopolysaccharide-activated macrophages by curcumin. Eur. J. Pharmacol. 384: 191-195. Gao, X., J. Kuo, H. Jiang, D. Deeb, Y. Liu, G. Divine, R. A. Chapman, S. A. Dulchavsky, S. C. Gautam. 2004. Immunomodulatory activity of curcumin: suppression of lymphocyte proliferation, development of cell-mediated cytotoxicity, and cytokine production in vitro. Biochem. Pharmacol. 68: 51-61. Porgador, A., E. Gilboa. 1995. Bone marrow-generated dendritic cells pulsed with a class I-restricted peptide are potent inducers of cytotoxic T lymphocytes. J. Exp. Med. 182: 255-260. Kodaira, Y., K. Ikuta, S. Tanaka, K. Yolomuro. 1999. Antigen-driven clonal accumulation of peritoneal T cells in vivo. Immunol. Invest. 28: 137-148. Lutz, M. B., C. U. Assmann, G. Girolomoni, P. Ricciardi-Castagnoli. 1996. Different cytokines regulate antigen uptake and presentation of a precursor dendritic cells line. Eur. J. Immunol. 26: 586-594. Sallusto, F., M. Cella, C. Danieli, A. Lanzavecchia. 1995. Dendritic cells use macropinocytosis and the mannose receptor to concentrate macromolecules in the major histocompatibility complex class II compartment: down-regulation by cytokines and bacterial products. J. Exp. Med. 182: 389-400. Trinchieri, G.. 1998. Proinflammatory and immunoregulatory functions of interleukin-12. Int. Rev. Immunol. 16: 365-396. Rescigno, M., M. Martino, C. L. Sutherland, M. R. Gold, P. Ricciardi-Castagnoli. 1998. Dendritic cell survival and maturation are regulated by different signaling pathways. J. Exp. Med. 188: 2175-2180. Arrighi, J. F., M. Rebsamen, F. Rousset, V. Kindler, C. Hauser. 2001. A critical role for p38 mitogen-activated protein kinase in the maturation of human blood-derived dendritic cells induced by lipopolysaccharide, TNF-α, and contact sensitizers. J. Immunol. 166: 3837-3845. An, H., Y. Yu, M. Zhang, H. Xu, R. Qi, X. Yan, S. Liu, W. Wang, Z. Guo, J. Guo, et al 2002. Involvement of ERK, p38 and NF-κB signal transduction in regulation of TLR2, TLR4 and TLR9 gene expression induced by lipopolysaccharide in mouse dendritic cells. Immunology 106: 38-45. Joyce, D., C. Albanese, J. Steer, M. Fu, B. Bouzahzah, R. G. Pestell. 2001. NF-κB and cell cycle regulation: the cyclin connection. Cytokine Growth Factor Rev. 12: 73-90. Cera, M. R., A. Del Prete, A. Vecchi, M. Corada, I. Martin-Padura, T. Motoike, P. Tonetti, G. Bazzoni, W. Vermi, F. Gentili, et al 2004. Increased DC trafficking to lymph nodes and contact hypersensitivity in junctional adhesion molecule-A-deficient mice. J. Clin. Invest. 114: 729-738. Shlomchik, W. D., M. S. Couzens, T. B. Tang, J. McNiff, M. E. Robert, J. Liu, M. J. Shlomchik, S. G. Emerson. 1999. Prevention of graft versus host disease by inactivation of host antigen-presenting cells. Science 285: 412-415. Caux, C., C. Massacrier, B. Vanbervliet, C. Barthelemy, Y. J. Liu, J. Banchereau. 1994. Interleukin 10 inhibits T cell alloreaction induced by human dendritic cells. Int. Immunol. 6: 1177-1185. De Smedt, T., M. Van Mechelen, G. De Becker, J. Urbain, O. Leo, M. Moser. 1997. Effect of interleukin-10 on dendritic cell. Eur. J. Immunol. 27: 1229-1235. Bonham, C. A., L. Lu, R. A. Banas, P. Fontes, A. S. Rao, T. E. Starzl, A. Zeevi, A. W. Thomson. 1996. TGF-β1 pretreatment impairs the allostimulatory function of human bone marrow-derived antigen-presenting cells for both naive and primed T cells. Transpl. Immunol. 4: 186-191. Yamaguchi, Y., H. Tsumura, M. Miwa, K. Inaba. 1997. Contrasting effects of TGF-β1 and TNF-α on the development of dendritic cells from progenitors in mouse bone marrow. Stem Cells 15: 144-153. Matasic, R., A. B. Dietz, S. Vuk-Pavlovic. 1999. Dexamethasone inhibits dendritic cell maturation by redirecting differentiation of a subset of cells. J. Leukocyte Biol. 66: 909-914. Piemonti, L., P. Monti, P. Allavena, M. Sironi, L. Soldini, B. E. Leone, C. Socci, V. Di Carlo. 1999. Glucocorticoids affect human dendritic cell differentiation and maturation. J. Immunol. 162: 6473-6481. Lee, J. I., R. W. Ganster, D. A. Geller, G. J. Burckart, A. W. Thomson, L. Lu. 1999. Cyclosporine A inhibits the expression of costimulatory molecules on in vitro-generated dendritic cells: association with reduced nuclear translocation of nuclear factor κB. Transplantation 68: 1255-1263. Berer, A., J. Stockl, O. Majdic, T. Wagner, M. Kollars, K. Lechner, K. Geissler, L. Oehler. 2000. 1,25-Dihydroxyvitamin D3 inhibits dendritic cell differentiation and maturation in vitro. Exp. Hematol. 28: 575-583. Penna, G., L. Adorini. 1α,25-Dihydroxyvitamin D3 inhibits differentiation, maturation, activation, and survival of dendritic cells leading to impaired alloreactive T cell activation. J. Immunol. 164: 2405-2411. Piemonti, L., P. Monti, M. Sironi, P. Fraticelli, B. E. Leone, E. Dal Cin, P. Allavena, V. Di Carlo. Vitamin D3 affects differentiation, maturation, and function of human monocyte-derived dendritic cells. J. Immunol. 164: 4443-4451. Hackstein, H., A. E. Morelli, A. T. Larregina, R. W. Ganster, G. D. Papworth, A. J. Jogar, S. C. Watkins, L. D. Falo, A. W. Thomson. 2001. Aspirin inhibits in vitro maturation and in vivo immunostimulatory function of murine myeloid dendritic cells. J. Immunol. 166: 7053-7062. Sallusto, F., M. Cella, C. Danieli, A. Lanzavecchia. 1995. Dendritic cells use macropinocytosis and the mannose receptor to concentrate macromolecules in the major histocompatibility complex class II compartment: downregulation by cytokines and bacterial products. J. Exp. Med. 182: 389-400. Joosten, L. A., E. Lubberts, M. M. Helsen, W. B. van den Berg. 1997. Dual role of IL-12 in early and late stages of murine collagen type II arthritis. J. Immunol. 159: 4094-4102. Triantaphyllopoulos, K. A., R. O. Williams, H. Tailor, Y. Chernajovsky. 1999. Amelioration of collagen-induced arthritis and suppression of interferon-γ, interleukin-12, and tumor necrosis factor-α production by interferon-β gene therapy. Arthritis Rheum. 42: 90-99. Rissoan, M. C., V. Soumelis, N. Kadowaki, G. Grouard, F. Briere, R. de Waal Malefyt, Y. J. Liu. 1999. Reciprocal control of T helper cell and dendritic cell differentiation. Science 283: 1183-1186. Brinkmann, V., T. Geiger, S. Alkan, C. H. Heusser. Interferon-α increases the frequency of interferon-γ-producing human CD4+ T cells. J. Exp. Med. 178: 1655-1663. Lappin, M. B., J. M. Weiss, V. Delattre, B. Mai, H. Dittmar, C. Maier, K. Manke, S. Grabbe, S. Martin, J. C. Simon. 1999. Analysis of mouse dendritic cell migration in vivo upon subcutaneous and intravenous injection. Immunology 98: 181-188. Bharti, A. C., N. Donato, S. Singh, B. B. Aggarwal. 2003. Curcumin (diferuloylmethane) down-regulates the constitutive activation of nuclear factor-κB and IκBα kinase in human multiple myeloma cells, leading to suppression of proliferation and induction of apoptosis. Blood 101: 1053-1062. Kong, A. N., R. Yu, V. Hebbar, C. Chen, E. Owuor, R. Hu, R. Ee, S. Mandlekar. 2001. Signal transduction events elicited by cancer prevention compounds. Mutat. Res. 480: 231-241. Sebolt-Leopold, J. S.. 2000. Development of anticancer drugs targeting the MAP kinase pathway. Oncogene 19: 6594-6599. Seger, R., E. G. Krebs. 1995. The MAPK signaling cascade. FASEB J. 9: 726-735.